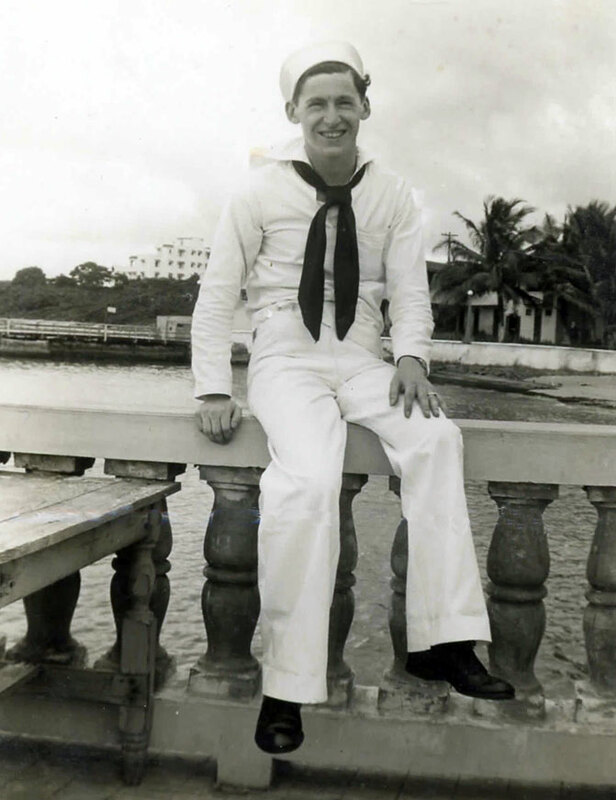 In early 1942, Mr. Ames enlisted in the Navy, and was inducted on May 1 as a Seaman First Class. (This was two levels above the lower ratings of a Seaman Second Class or a Seaman Apprentice.) A college graduate, he did not undergo basic training, but instead, was immediately transported to the Caribbean via a train from Boston and a vessel from Norfolk, VA. Shortly after arriving in San Juan, Puerto Rico, he volunteered for assignment to the RPIO (Registered Publications Issuing Office) there, after finding out that there was “a pretty blonde” working in that office. According to the “Guide to United States Naval Administrative Histories of World War II” (by the Naval History Division, Department of the Navy – published in 1976), an RPIO was part of the Division of Naval Communications, and was responsible for maintaining and distributing certain secret and confidential publications, in addition to operating a mail and courier service. There were many RPIOs, as they were associated with every major Naval operations base. Mr. Ames served at the San Juan RPIO through the summer of 1944. He then received a commission, becoming an Ensign. During the fall of 1944, he attended officer’s school in Hollywood, Florida. That winter, he attended Naval Training School at Harvard University, where he studied Communications. 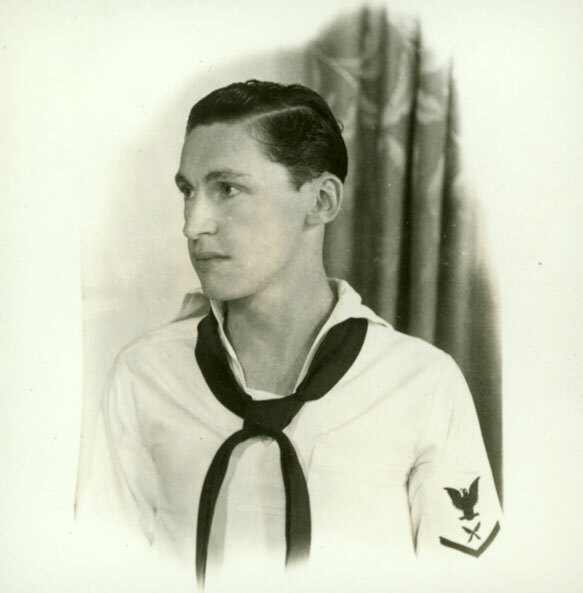 In April, 1945, he was transferred to the RPIO in Pearl Harbor, Hawaii, where he served during the remainder of the War. Above, an officer in Pearl Harbor – arm around a young lady. Below, more pictures of Sidney in uniform. 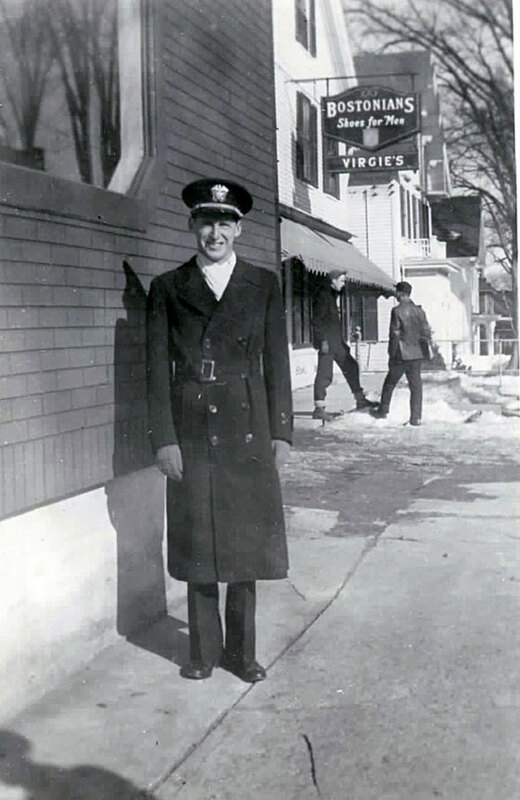 After the war, Mr. Ames returned to Orono, Maine. 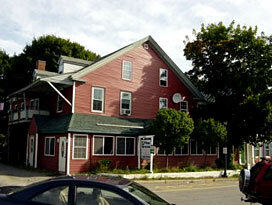 There, his father Sam and mother Fannie owned and operated a bowling alley and pool hall, located at 22 Mill Street in Orono. The business had started in the late 1920s in nearby Bangor, Maine, when Sam, who had previously worked in a knitting mill, opened a pool hall and shoeshine on Exchange Street in Bangor. In 1930, the family moved to Orono, where Sam retained the pool hall business, lost the shoeshine, and added a few lanes of bowling. Renting a location in the basement of the local movie theatre located at 74 Mill Street, Sam was soon forced to move the business, for “talkies” had quickly become popular and patrons of the upstairs movie theatre were complaining about the noise emanating from the bowling alleys below. Sam then purchased a small building at 22 Mill Street that had been a tailor’s shop, but it was too small for the bowling alleys Sam had in mind, so Sam had to hire a carpenter to lengthen the building. 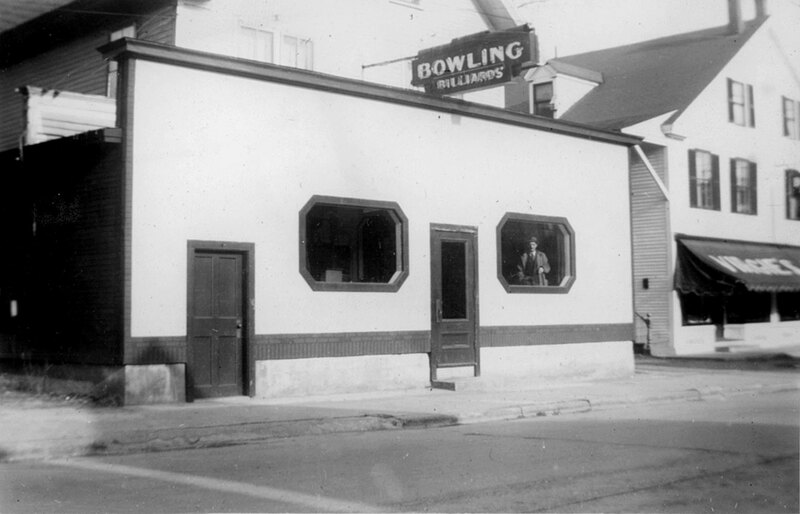 Eventually the building accommodated 2-3 lanes of bowling on either side, and a couple of pool tables in the middle. The family lived in an apartment above the business. 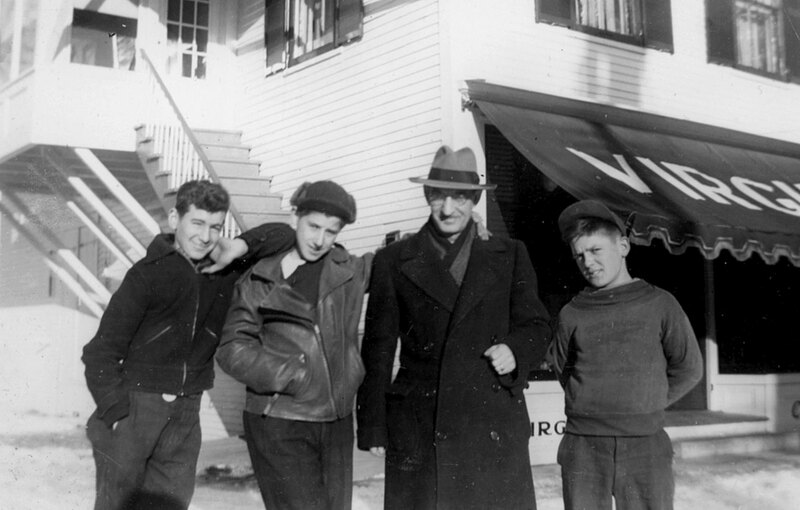 During the school year, business was good, as lots of college students from the nearby University of Maine, organized into bowling clubs, were patrons. But the business closed for the summer after the college students left town for their summer vacation. 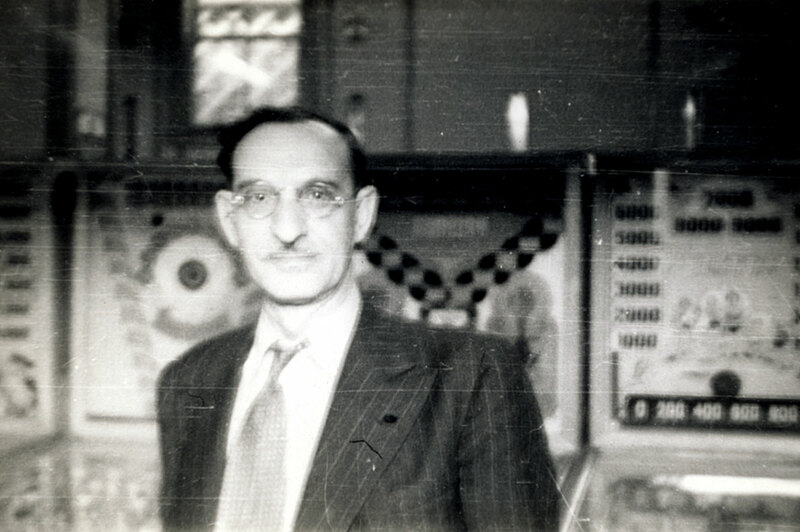 So, during the summers of 1934 and 1935, Sam, Fannie, and Sidney all travelled together on the carnival and fair circuit with some of the first pinball machines ever to be made. Tommy Hashey was an Orono police officer for many years. He recently passed away. 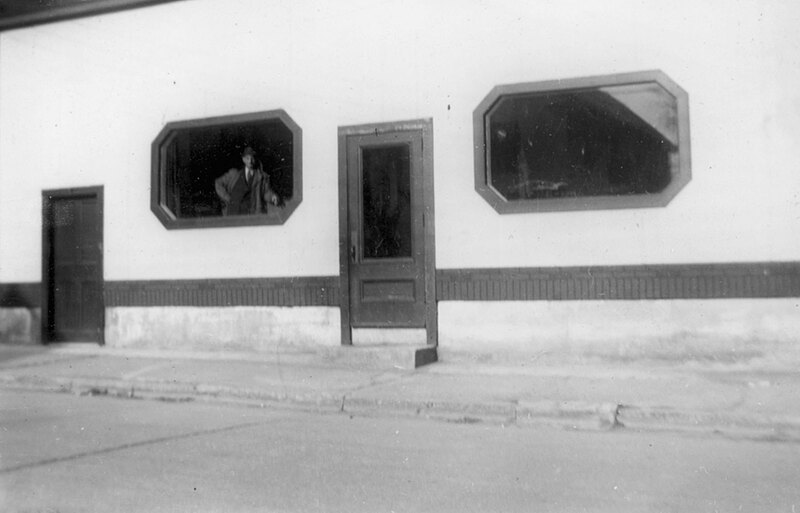 The next door business, Virgies, sold shoes and men’s clothing. 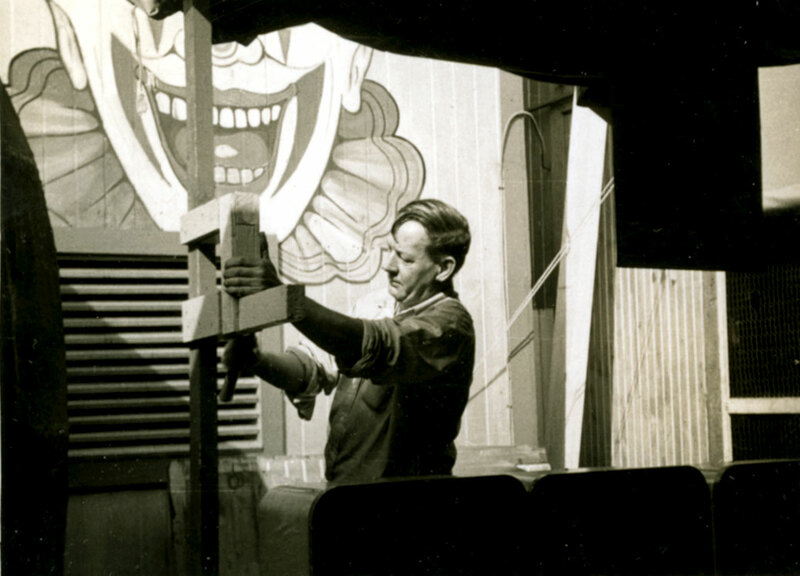 Hearing from an associate on the carnival and fair circuit that a stand was available at Old Orchard Beach, Sam opened a summer business in Old Orchard Beach in 1936 with a few arcade games. By 1940 this summer business was well established and had 3 stands, including roll-down poker tables and “Kentucky Derby” horse-racing tables, which did very well. The tables were manufactured by the Scientific Machine Corp of Brooklyn, NY. The Ames family was on good terms with Scientific Machine’s owner, Max Levine, later buying some of the company’s Ski-Bowls. One of the oldest games still working and on the floor of the Half Moon arcades was made by Scientific Machine, and can be seen here. Sam Ames, Stella Rolf, and Fannie Ames. 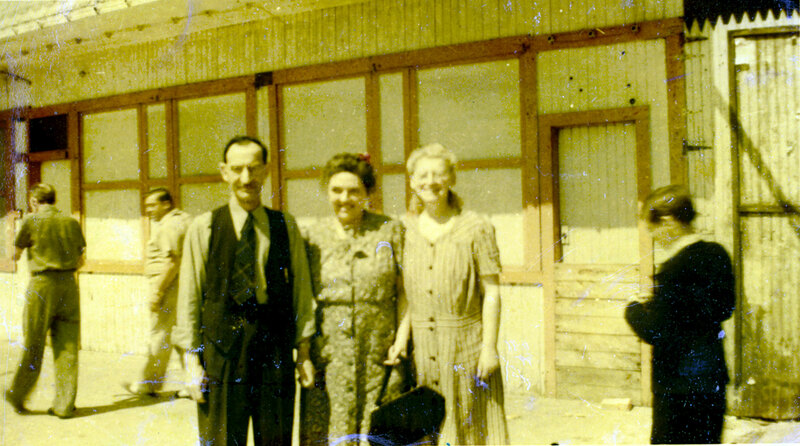 Stella, along with her husband Oliver (see below), were longtime employees who followed the family business to Weirs Beach. 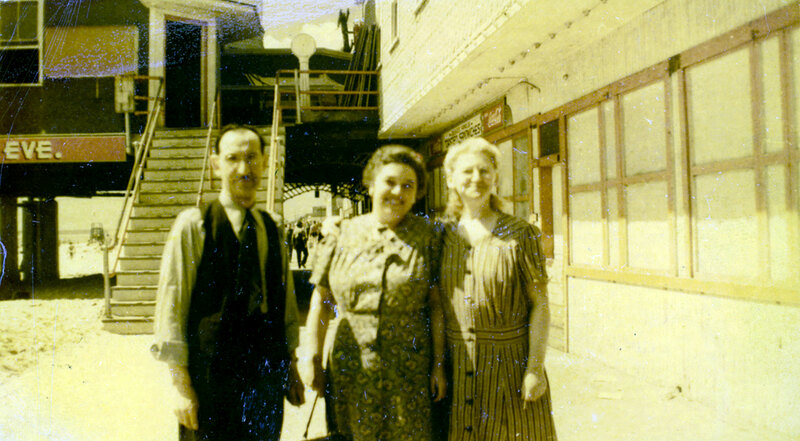 Stella remained an employee until the mid 1970’s, working as a cashier in the original Weirs Beach arcade. The stockroom above the original Weirs Beach arcade to this day is still called “Stella’s Stockroom”. 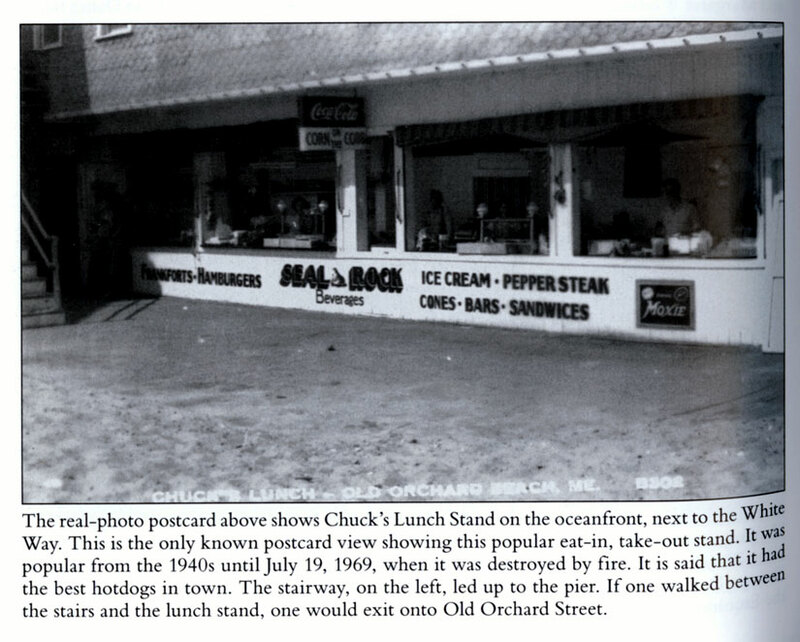 Above, a postcard from the Arcadia publishing book, “Old Orchard Beach” by Daniel E. Blaney, reveals where the above photos were taken. 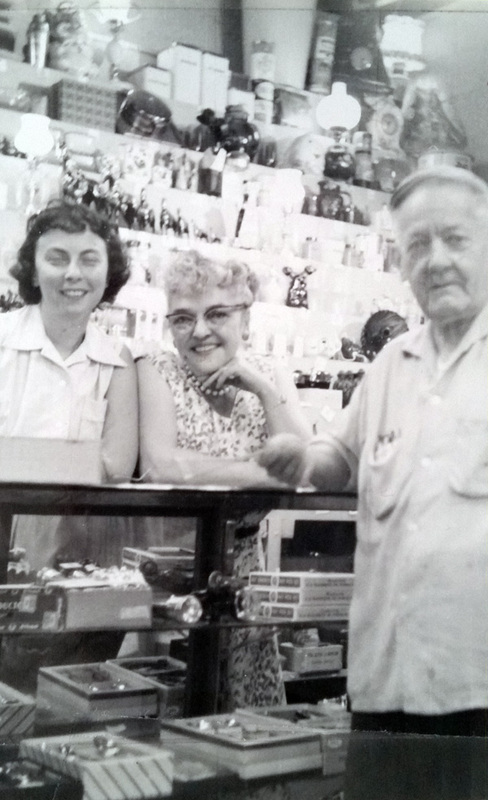 Below, Stella Rolf, center, behind the prize counter at the original Half Moon Arcade, in 1959. On the left, Stella’s daughter Annette; on the right, her husband Oliver. Oliver Rolf, husband of Stella. 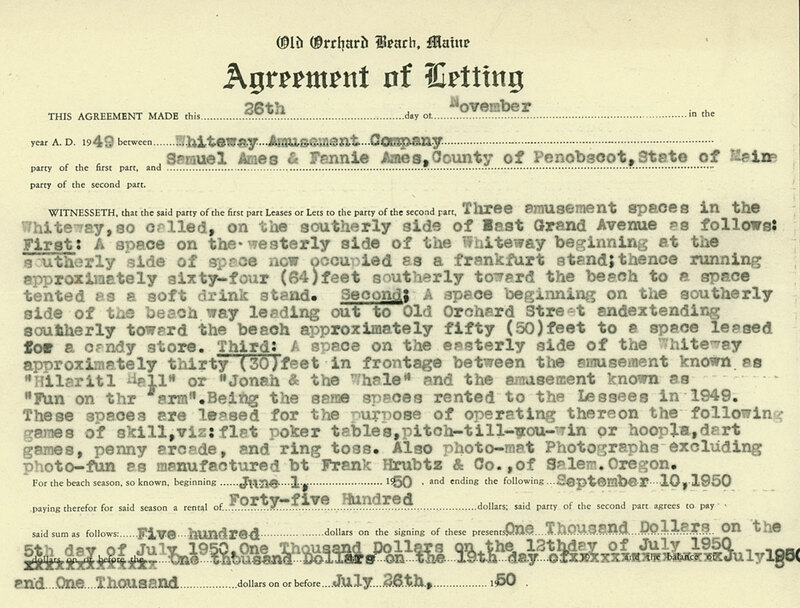 Every fall, the Ames family would sign a lease for the following summer with the Whiteway Amusement Company for their three amusement spaces on the Whiteway. 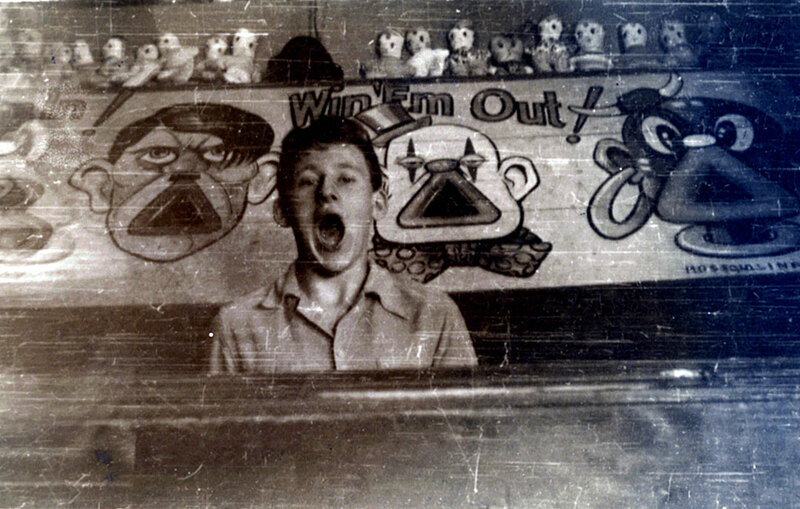 There, on the Whiteway, the Ames family operated the “Whiteway Penny Arcade”. The basic prize was a “Half-Coupon”, seen below. The idea behind the half coupon was that customers would receive twice as many tickets for a given prize as would otherwise be the case. Therefore, customers would feel they were winning more. 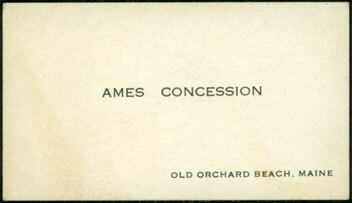 This prize philosophy continued when the business relocated to the Half Moon Penny Arcade at Weirs Beach. 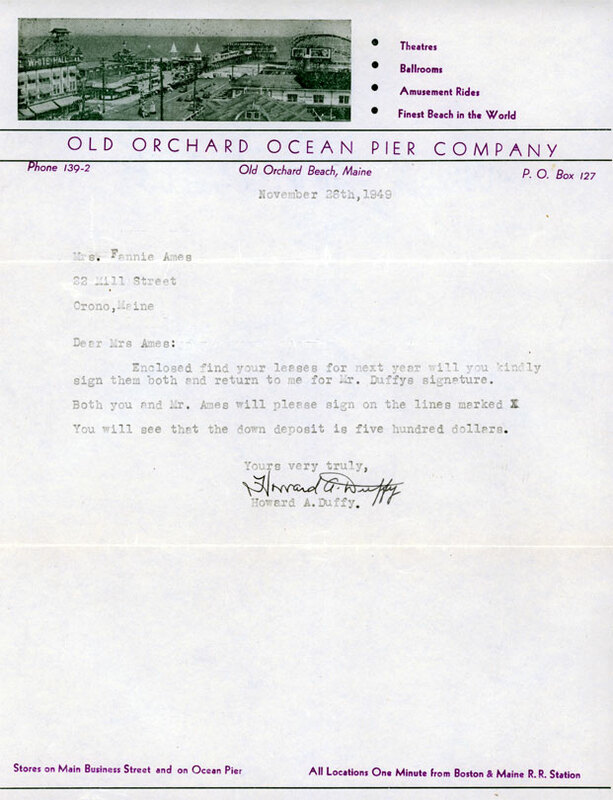 Below is the Whiteway lease for the last season in Old Orchard, the season of 1950. Also shown is the front and back of the envelope which contained the lease and the letter which accompanied it. In June of 1950 Sam Ames suddenly passed away. Sidney Ames and his mother Fannie carried on the family business, moving it permanently to Weirs Beach in 1951. 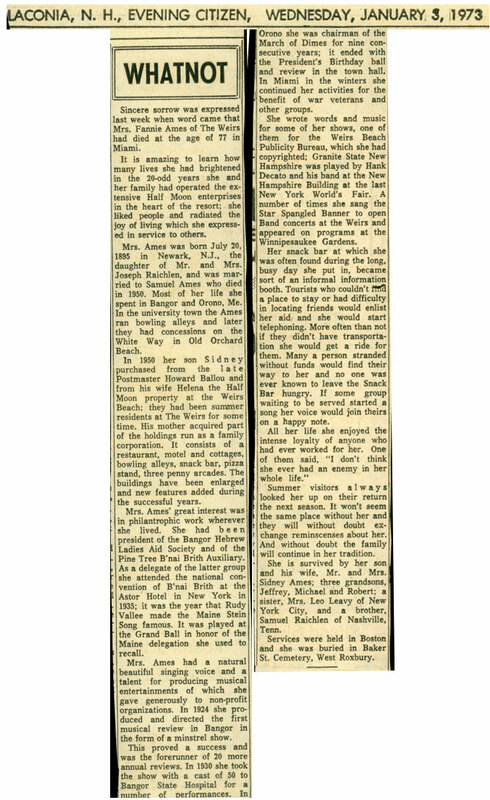 Fannie was very active in the business and is still remembered fondly by the many persons who knew her. She passed away December 23, 1972. Sidney Ames passed away on January 29, 2009. 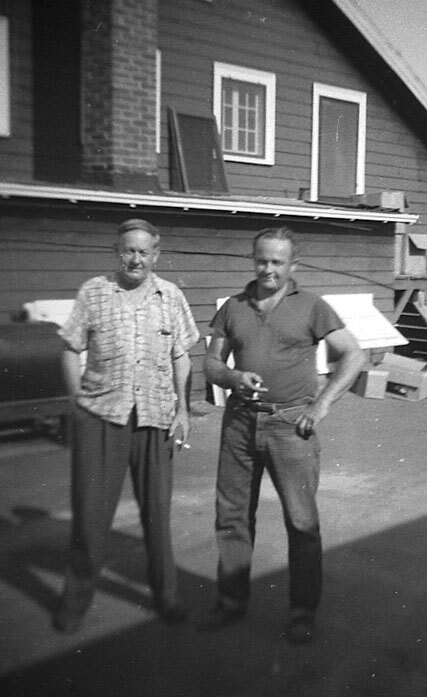 Oliver (on left) at Weirs Beach circa 1955, behind the old Half Moon restaurant. The identity of the man on the right is unknown. This 2007 photo of the bowling alley, now a coffee shop/bookstore called the Store Ampersand, shows the front of the building has been completely changed. 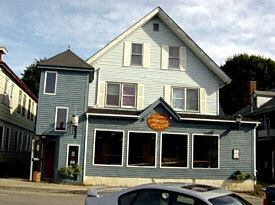 This 2007 photo of Virgies, now a Thai restaurant, also shows the front of the building has been transformed.